SpongeBob SquarePants fans beginning today can build their very own Bikini Bottom with Nickelodeon’s brand-new city building app, SpongeBob Moves In. Available worldwide, SpongeBob Moves In features a stylized 2D design and gives fans a whole new way to interact with the hit animated series. NEW YORK – June 6, 2013 – SpongeBob SquarePants fans beginning today can build their very own Bikini Bottom with Nickelodeon’s brand-new city building app, SpongeBob Moves In. 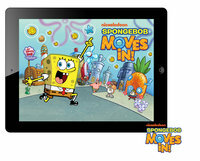 Available worldwide, SpongeBob Moves In features a stylized 2D design and gives fans a whole new way to interact with the hit animated series. In the game, players build Bikini Bottom to their own tastes and are tasked with keeping the city’s residents happy by making all their wishes come true. As players advance in the game, they can unlock exclusive-to-the-app, untold stories about how their characters, including SpongeBob, Patrick, Mr. Krabs, Plankton, Squidward and Sandy, first arrived in the town. Written by the SpongeBob SquarePants series writing staff, these stories are told through brand-new animated short videos unlocked throughout the game. “Millions of fans around the world experience the fun and magic of SpongeBob on television every day, and now they can live out their very own Bikini Bottom adventures with SpongeBob Moves In whenever and wherever they want,” said Steve Youngwood, EVP and General Manager, Digital, Nickelodeon Group. Since its launch in July 1999, SpongeBob SquarePants has become one of the most beloved animated characters in TV history and a global pop culture phenomenon. In its 13th year the series continues to rank as one of the most ‘liked’ animated series on Facebook, with more than 81 million fans. In SpongeBob Moves In players can customize the look of their undersea city with a variety of characters, buildings, and accessories. In the ongoing quest to keep Bikini Bottom inhabitants happy by fulfilling their wishes, players must collect happiness to fill the town’s happiness meter. Residents wish for food and gifts from the various Bikini Bottom restaurants and shops, like Krabby Patties from the Krusty Krab or a bouquet of flowers from the Flower Shop. Once their wish is granted a treasure chest will appear for the player to open and collect gold coins, happiness or a new recipe to add to their collection. When the happiness meter is filled, players advance to the next level in the game, earning coins, game experience and unlocking more quests, buildings and accessories to buy in the store. 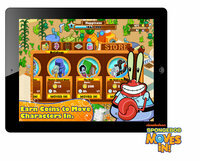 Throughout the game, players earn gold coins and Jellyfish Jelly as rewards for performing a variety of activities like granting wishes, building buildings, making recipes, collecting rent and expanding their Bikini Bottom. Players can purchase additional land, ingredients, buildings and decorations using game coins and jellyfish jelly, or an iTunes account. SpongeBob Moves In is available worldwide in eight languages: English, Spanish (Latam), Spanish (Spain), German, French, Dutch, Portuguese and Italian. 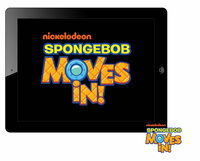 For additional information on SpongeBob Moves In, visit SpongeBobMovesIn.com. SpongeBob SquarePants is executive produced by creator Stephen Hillenburg, who previously worked as a writer, director and creative director on Nickelodeon’s animated series Rocko’s Modern Life. Paul Tibbitt served as a director and writer on SpongeBob SquarePants for its first three seasons and is currently executive producer. Nickelodeon, now in its 34th year globally and 15th year in Asia, is one of the most globally recognized and widely distributed multimedia entertainment brands for kids and family. The company has built a diverse, global business by putting kids first in everything it does with a portfolio that extends across television, music, publishing, digital media, mobile and consumer products. Nickelodeon and Nick Jr. are seen in more than 60 million households throughout North and Southeast Asia region with 24-hour programming services including Nickelodeon Southeast Asia, Nickelodeon Korea, as well as Nickelodeon branded programme blocks and syndications. For information about Nickelodeon in Asia, visit www.nick-asia.com.